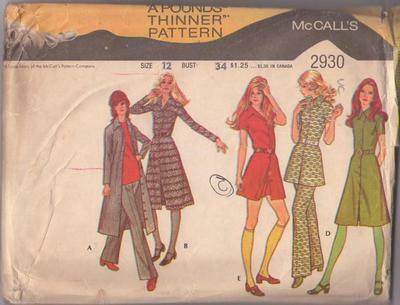 1971, 70s Mod, Retro Casual Clothing Patterns - Dress or tunic and pants or shorts. Dress or top buttons or zips up the front; love it long like a coat, don’t you? Shorts & pants have elastic in waist casing. Long dress view would make a cool jacket or cover up coat!